LOS ANGELES, California, June 7, 2011 (ENS) – The owner of a San Fernando Valley condominium complex was sentenced today to four years in federal prison for conspiring to violate the Clean Air Act’s asbestos work practice standards during the renovation of the 204-unit apartment building. The work caused asbestos to be released into the complex and the surrounding community. Charles Yi, 45, of Santa Clarita, was sentenced to 48 months in prison by United States District Judge Percy Anderson. Yi was found guilty in March of five felony offenses. The jury also convicted Yi of failing to notify the Environmental Protection Agency and the South Coast Air Quality Management District about a renovation containing asbestos, failing to provide a properly trained person during a renovation containing asbestos, failing to properly remove asbestos and failing to properly dispose of asbestos wastes. A second man involved in the case also was sentenced today. John Bostick, 41, also of Santa Clarita, pleaded guilty in February 2011 to conspiracy to violate the Clean Air Act. He was sentenced to three years of probation, which is to include six months of home confinement and 150 hours of community service. Yi was the owner of the now-defunct Millennium-Pacific Icon Group, and Bostick was its vice-president. Millennium-Pacific owned the Forest Glen apartment complex in Winnetka that was being converted into condominiums in 2006. Knowing that asbestos was present in the ceilings of apartments in the Forest Glen complex, Yi, Bostick and the project manager, Joseph Yoon, hired a group of Latino day laborers who were not trained or certified to conduct asbestos abatements. The workers scraped the ceilings of the apartments without knowing about the asbestos and without wearing any protective gear. The illegal scraping resulted in the repeated release of asbestos-containing material throughout the apartment complex and the surrounding area because Santa Ana winds were blowing during the time of the illegal work. After the illegal asbestos abatement was shut down by an inspector from the South Coast Air Quality Management District, the asbestos was cleaned up at a cost of approximately $1.2 million. Yoon, 34, of Studio City, pleaded guilty to conspiracy charges in June 2010. Yoon is scheduled to be sentenced by Judge Anderson in July. The federal Clean Air Act requires those who own or supervise the renovation of buildings that contain asbestos to adhere to certain established work practice standards. 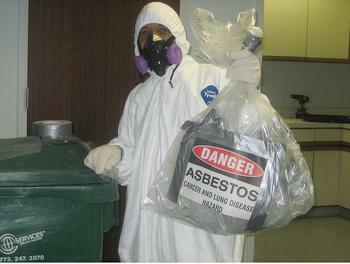 These standards were created to ensure the safe removal and disposal of the asbestos and the protection of workers.